Note: Please download the post-jam bugfix version below. This was submitted after the deadline but the only changes are to fix a couple of issues which occurred on some systems: a frame rate issue and a crash on victory. This game is my submission for GitHub Game Off 2018. It's a hybrid between a game with a rising lava pit and a bullet hell game. It runs on Windows and was developed in C# and .NET Framework 4.7.1 . You guide an explorer, Jo Whitstilmacenstein, who is exploring the inside of a volcano with a protective heat suit when he hears rumbling noises all around him. 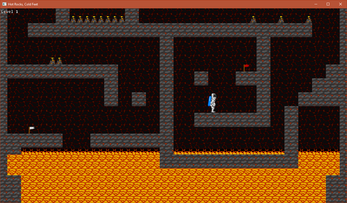 Pools of lava begin to appear at his feet, and he knows he has to get out as soon as possible. In the end there were lots of little things left unfinished and very little time to do it so I just focused on making the game playable. There are four levels in total. Use the left and right arrow keys and space to jump, or the W A D keys. F12 will get you into a barely functional level editor - you can edit the level with the mouse (left to place tiles, right to destroy them, click on an existing tile to change its type). 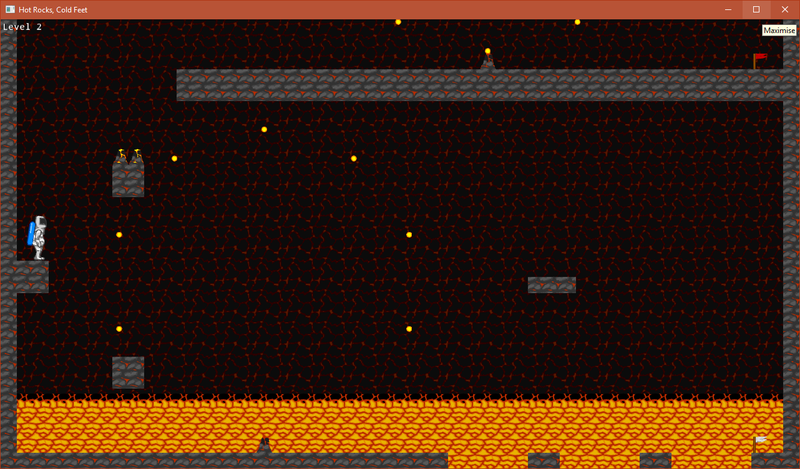 You can still die, but the lava stops rising in the level editor. 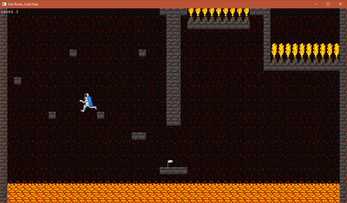 F1 to save the level to a file (overwrites the existing level in slot 1, 2, 3 or 4). Click the Download link below to get the .zip file which contains an installer for this game (should be setup.exe). You may also have to install the .NET framework runtime 4.7.1 from Microsoft - I don't know if it requires it. You can build and run this from source, if you have Visual Studio, C# and the .NET Framework.